Old authors have used colored halos to represent the light shed by Divinities. In man, coronets of light show the irradiation of an enlightened conscience. The luminous outlines correspond to the spirituality and their harmony corresponds to the degree of harmony of conscience. Therefore the aura of sanctity is represented by a solar color clearly outlined and arranged in the shape of a rainbow. The aura irradiated by an advanced conscience, although less bright, is well defined and its colors are regular. In the sacred images colors design perfect uniform circles, without any blend among shades, whilst the aura of less developed consciences marked by mental indetermination and ruled by a confused and bewildered emotiveness, reflects dull colors and undefined spots. Up to the sixties, auras and aureoles were known only through sacred art; therefore many people thought they were only a myth, until a Russian scientist called Kirlian invented a machine able to photograph the energetic fields that surrounded every living form. The invention of Kirlian's machine caused sensation, upsetting the scientific world which, by now, was able to study the phenomena of energetic irradiation that surrounded both living forms and material objects. It gave the certainty that the meanings of the aura were not only symbolic principles. Sacred art uses two kinds of irradiations. The oldest eastern iconography shows wide irradiations that surround the whole body of the illuminated. The most recent western iconography, on the other hand, concentrates on the irradiation of the head in the shape of an aureole. Despite the apparent difference the two representations are not conflicting, because the aureole of the head is the top of two aureoles below, just as relevant. According to the initiatory principles auras irradiate from the vital centers of human being. These centers are not independent but they are active when they form triangles linked with each other. The highest center is made of heart, head and throat, in this order, and it is the triangle of human excellence. A completely developed aura includes three aureoles, of which the one of the head is at the top. In its geometrization, the energy that rises from the four lower centers transforms itself and vivifies the centers of conscience of the three higher centers placed above the solar plexus. In this inner journey the highest transforming center is the heart's one. Not in the sense of organ (*), but in the sense of en ergy that improves values and virtues of the conscience and the physical mind. (*) Note : Christianity represents the burning heart, in the icon of Jesus Christ who supports with his left hand the heart overlooked by a flame, symbol of lighted spirituality and surrounded by a crown of thorns, symbol of suffering and mercy. Going up, the cardiac energy reaches the center placed at the top of the head (which westerners call coronal center , and easterners call chakras with “a thousand petals” ) and lights the aspect of the impersonal will. Love and impersonal will (see appendix) activate the center of the throat, seat of creative intelligence (which doesn't mean imagination), forming the triangle of excellence that reveals the Trinitarian aspect made by altruistic will (Father aspect), wise and conscious love (Mother aspect) and creative intelligence (the so-called Son aspect). The “union” between heart and head is made possible by a subsidiary center placed in the higher part of the back called scapular center. Its way of irradiation creates a double halo which, extending towards the top, takes the shape of two wings. This phenomenon can be found in the sacred images represented by winged figures. The energetic centers, called ganglia or chakras (in Sanskrit “wheels” because the energy they contain rotates fast on itself) are usually represented by the frontal part with energetic extensions similar to petals. But the petals are only the terminal part of the centers which, instead, can be found at the back of the spinal cord. A lot is written and said about the ascent, re-climbing and inner path. Nevertheless is never clear that the path for the re-climbing is inside man and occurs along the spinal cord. This journey is necessary for unconscious energy to find again the conscience of self, realizing of being immaterial and different from the half-blind identity of physical reason. Vital energy (the snake of fire) starts from the coccyx, goes up along the centers of the spinal cord and reaches the mind, reawakening its consciousness. This is the reason of the metaphor of the snake of knowledge twisted around the Tree. 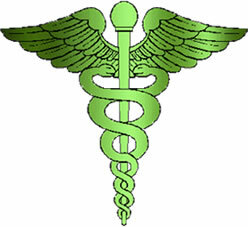 The tree is in reality the spine and the snake is the energy that becomes conscious of itself going up through the three paths pictured in the caduceus (knowledge of evil and then good). Eastern doctrines as well talk about three snakes that going up, meet and vivify the chakras along the way. Once reached the top of the head the energy turns into power, clear will that frees the mind (see the wings of the caduceus) from the ties that imprisoned it to the animal nature (*). Genesis, II, 17/18. «… At this point, the land won't produce but thorns and bramble bushes and the Earth will be cursed because of you…» Mystic says that the universe degraded because of Man, its guardian. This sentence reminds of the hilè of the Gnostics that referred to the prime Matter of the lower World of the Universe. In old Greek the word Hilè meant what appeared wild and not cultivated, land and woodland. Its meaning is antithetic to the biblical idea of Eden, which, on the contrary, means what appears to be well groomed, the garden and therefore order, east, light. Adam lived with Eve in the Garden of Eden until his descent in the “world of desire”; after knowing Good and Evil by feeding on them, Eden became hilè. This drama represents the individualization of humankind, the separation of sexes, the loss of group memory from which originates the idea of punishment for a sin never committed. In the drama man is covered in animal skin, allegory of his integration in the physical body belonging to the animal Kingdom, and for him Eden (which is not a physical place but the metaphor of a state of conscience) is crystallized and obscured. Therefore to the “Garden of Light” succeeds the perception of a physical universe in which the thickness of its materials stops the light and makes it dark and the Forms appear to be heavy and dark. In the book “Man, Grand Symbol of the Mysteries” the scholar Palmer Hall reports the aureoles of the mosaic seen in the Basilica of St Mark in Venice (XIII century) dedicated to the Christ on the Mount of Olives. The aureoles are the irradiation following the transmutation of a conscience that, taking the plunge, becomes conscious of its universality. The balanced geometry of straight and curved lines represents the solar forces of the soul and the lunar ones of a re-integrated personality (*). (*) Note if we simplify the concept of re-integration, intellectual transmutation and spiritual transfiguration , we can say that the physical conscience is the reason from which originate the thoughts of the physical-animal body, that is the thought that acts through the brain. The subtle conscience, on the other hand, called archetypical identity, is the energetic part outside the body, inside the field called aura. To re-connect the physical and metaphysical components of one's own conscience means to re-integrate the two identities in a unique profile, making the same identity. This considerable expansion of conscience leads to an extraordinary mental and intellectual development that, we must underline this, only further on can lead to spiritual feelings. The intellectual transmutation marks the opening of a new area of consciousness, in which the mental vision opens wide to a reality that was ignored beforehand; the inner awakening opens the link between material conscience (reason) and subtle conscience that physical senses can't reach. This contact transforms the mind and re-generates itself, starting the spiritual awakening. The Christian gospels tell an episode of spiritual transfiguration . In the part called the Sermon on the Mount, we read of the great dramatic moment when Jesus' disciples witnessed his transfiguration and the inner irradiation enlightened his body. The crowned cross is the symbol of spiritual transmission. The crowned cross is the symbol of the heart radiated by the light of the soul. In this way, from symbol of pain the cross becomes symbol of illumination. 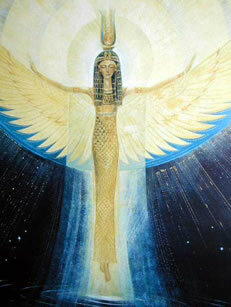 The sacred art acknowledges many kinds of aureole, each with its characteristics and meanings. Arthur Powell collected some meanings of the mystic. 8 th ) symbol represents the link with the divine Logos (the Word or Generating Sound). The next image represents the complete spiritual realization. It is the re-integration of personality-soul-spirit, symbol of the highest conceivable initiation in a human environment. The triangle represents the dimension of the divine monad, the super-mundane plane. 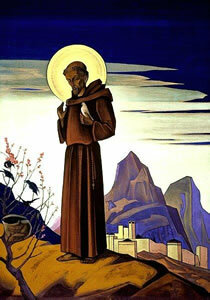 The monad is a spark of God's conscience that vivifies the being. It is a divine atom that, with its energy, irradiates the densest planes, starting from the soul, then the planes of conscience below, up to the sphere that represents the physical dimension. The physical mind is the boundary between the limited conscience of the physical man and the area of unconsciousness (shadow, or darkness of the soul) of the astral-instinctive-animal dimension of his lower nature. Thinking of the evolutionary process called “living”, men have often dramatized the “whys” to which they couldn't answer. They replaced the missing answers with imagination. Life, even the individual one, is a cyclic process connected to the rhythms of the universe, therefore to understand the rhythms of the universe means to understand the aspects of life (see Great Book of Nature). The main traditions agree that the aura is a magnetic field that holds the irradiation of the different energetic aspects. 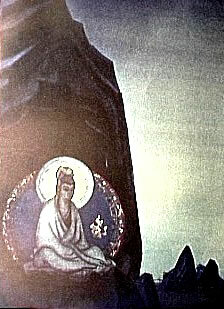 These aspects are at first quite imperfect, if not missing at all, such as the spiritual aura, but then they start arranging themselves through the process called inner progress; this means that several aspects, interacting with each other, grow stronger and develop the ability of discerning, therefore called “ aura of wisdom ”. In order to describe the different aspects of the aura let's borrow the most used words in the different traditions. In its general aspect the aura is the field of the conscience it contains (like an onion's skins), the electro-vital aura, called ethereal body, the electro-mental aura called astral or desire body, that develops in mental and higher mental body. There is also the aura of the egoic body which is the physical expression of the soul and finally, the spiritual aura. Inside the physical body there is the mind, that is the physical conscience that formulates thoughts, expressed through the brain. The physical conscience is moved by the energy called serpentine Fire. Once the serpentine fire, called by easterners Kundalini , reaches its highest expression, it becomes the Power of the Snake. Going up like lava from a volcano, the serpentine fire (the Kundalini ) transforms by burning on his way every false element. Therefore it is a destructive agent, dangerous to move through improvised experiments. Initiatory transfiguration in the East is represented by a big Royal Cobra, erected, with three smaller cobras on each side. In total their number is 7. Kundalini is a primordial, generative and sexual energy (see libido, then eros and psyche) situated in the coccyx. Eastern tradition links the energy of Kundalini to the energy of the magma of the planet. 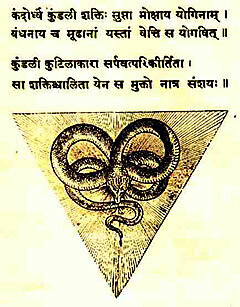 The Royal Cobra represents the complete awakening of the serpentine Fire and its ascent to the main center of the head, whilst the 6 cobras next to it represent the 6 Chakras below completely revived. 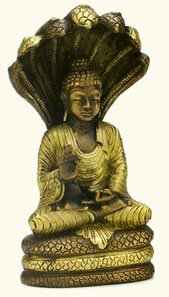 The Buddha (this word means enlightened) is often represented in meditation, sitting in the position “of the Lotus” overlooked by 7 Naga (naga in Sanskrit means royal cobra) that, with the membranes of their neck completely open, watch over him protecting him from danger. The meaning of the allegory is obvious. Once the serpentine Fire has made the conscience completely alert, it is ready, in its complete mental opening, to recognize any kind of mistake. The serpentine Fire reacts to certain mental waves (electromagnetic impulses) emitted by the will. The mental waves are quiet sounds, to which the Snake answers, as the Commentaries say, by moving its tail. This is an expression that implies how the psychic activity is waking under the influence of certain energies. The description of the Abbott is cryptic, but it leads us to another concept: the idea that the planet as well has an astral, ethereal, mental and spiritual aura. In this case the anima mundi, or akasha, are the reflective ether that holds the impressions of every impressed thought and that an advanced conscience can “read”. 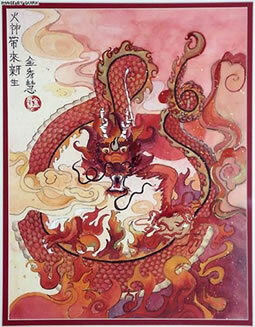 For this reason the winged Snake or Dragon are the symbols of the initiatory knowledge, the Power that enlightens and the Fire that destroys every form different from itself. Besides the said meanings, this symbol encloses two more relevant meanings: the ascending and descending initiation which we will try and resume.